Korean Soft Serve Ice Cream. Delicious and fun to eat! We had heard good things about the street food in Seoul. To be on the safe side, we decided to sign up for a tour with O’ngo Food. They had several options, depending upon the desired experience, but we thought the half day walking tour sounded like fun and it was affordable. The food tour started with a demonstration for cooking a traditional style Korean Pancake. At the tour company, there is a demonstration kitchen. It’s really nice…each table has a cooktop and lots of room to prepare food. For the foodie, it’s a great way to start a tour! 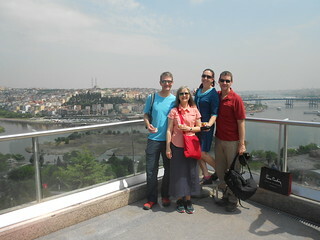 After the host answered all our questions, we left to begin the walking portion. Our group had about 8 people, so it was the perfect size. Our tour guide took us to about 6 different vendors. Some were walk in shops and some were food carts. 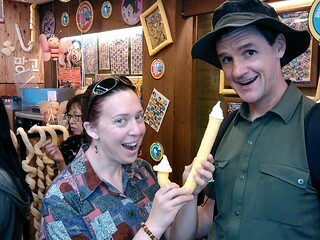 At some point, we also walked through a huge indoor market. The guide spent a lot of time explaining the ingredients and the variations in serving and preparations. The tour ended in a restaurant, where we had a traditional Bi-Bim-Bap. By the time the tour was over, everybody was completely full. 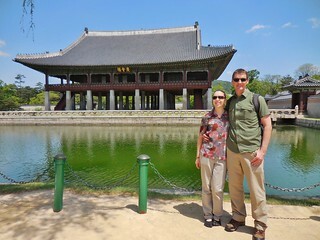 Later in the afternoon, we went to Gyeongbokgung Palace for a walking tour. There was a Changing of the Guards ceremony, so we lucked out with our timing! Insadong Shopping District is Fun! 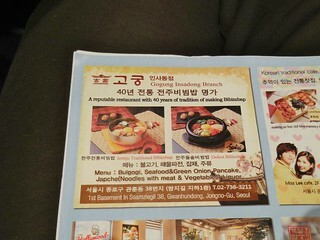 Bi-Bim-Bap Menu! This place is awesome…it’s been in business for 40 years and has a continual stream of customers. Arrive promptly at 11am to beat the lunch crowd and get a table. 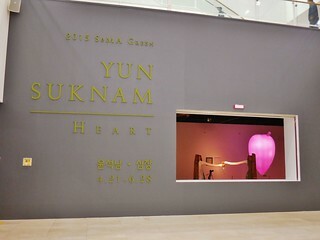 Yun Suknam’s Heart exhibit at the SOMA. We really loved her work; full of passion, purpose, and creativity. 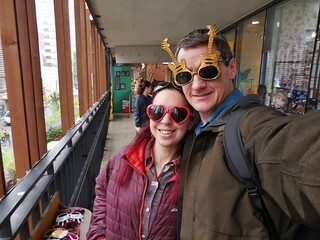 Our first full day in Seoul was jam packed with activity. 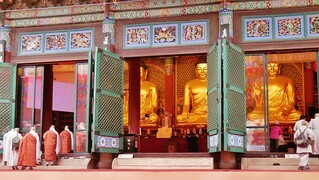 We started the day with a visit to the Jogyesa Korean Buddhist Center. 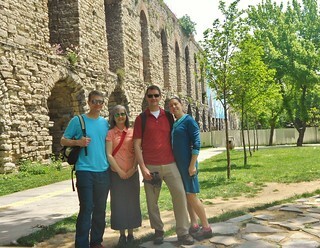 Then, we walked around the Insadong Shopping area and explored the streets of the old city. We had a traditional Bi-Bim-Bap lunch at a local hotspot, followed by a subway trip to the SOMA (Seoul Olympic Museum of Art). 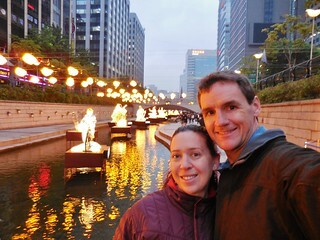 Wrapped up the adventure with a romantic stroll along the Cheonggyecheon River. On a Limo Bus, after an 11 hour flight. The flight from Seattle to Seoul went very smoothly. 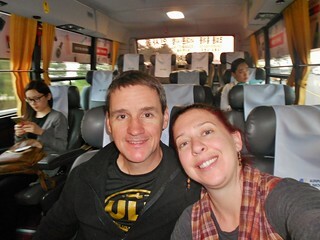 Once we had landed in Seoul, it was easy to find the Limo Bus, which takes people from the Incheon Airport to the downtown area with minimal stops. The bus ride is 45-50 minutes. 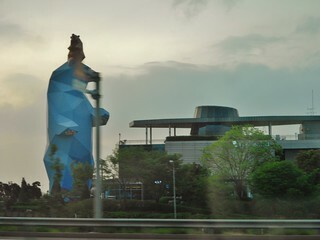 A very large blue bear, which reminded me of the large blue bear we have at the Denver Convention Center. 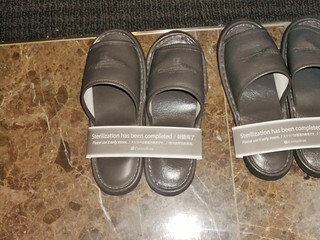 Fresh, clean slippers to be used in the room! Finally, we arrived at our bus stop and walked one block to the hotel, CenterMark. The location and price of this hotel was perfect for us. Our room was small, but we were just there for a few days, so something simple was fine. We were exhausted after the long flight, so we called it an early night.